Containment Protocols: RPC-007 is located on one of the numerous unexplored islands of the Philippine Archipelago, designated OL-Site-03; global coordinates: ███████. Due to the nature of RPC-007, it cannot be relocated without possible destruction, though the small size and isolated position of the island make it relatively secure to begin with. Signs in Tagalog and English are to be maintained at five meter intervals marking the island as property of the Philippine government and restricted from unauthorized visitation. At least four Authority security personnel are to be kept on active detail on the island, posing as government security officers, in order to apprehend any trespassers. Description: RPC-007 is an immobile, seemingly sapient entity resembling a tree of indeterminate species. The roots and lower half of the trunk display no noticeable anomalous qualities. It is only the top half of the subject that is unusual. Beginning from approximately 70 centimeters up the trunk, the natural wood of the tree is overtaken by a growth that displays the physical properties of wood yet also possesses the ability to flex and move like flesh. 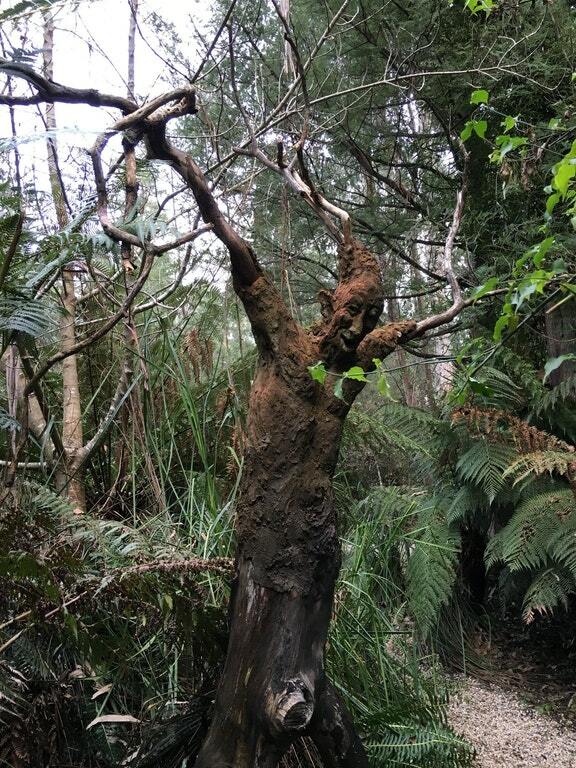 This anomalous growth culminates at the top in the form of a human head and two permanently upstretched upper arms from which sprout otherwise normal but barren branches. The head includes all normal features one would find on the average non-anomalous human head with the exception of hair. Orifices such as the ears, mouth, and nose contain relatively shallow holes that do not connect to any internal system. Despite this, they function as well as their non-anomalous counterparts, with the exception of consuming food and breathing, of which the subject has displayed no requirement. RPC-007 is fluent in both Tagalog and English, and speaks with a notable American southern accent in both languages. It professes to be a man of considerable age, though it goes out of its way to avoid giving a numerical figure, either waving away the question or outright ignoring it. When asked to state its name, RPC-007 will always give the first name Joe, but will give a different surname every time it is asked. To date, RPC-007 has stated over 1,000 different last names of mostly western European and East Asian origin with very little repetition of previous names. When confronted with this fact, RPC-007 will once again wave away or ignore the information. RPC-007 is generally averse to discussing itself, only imparting personal information cryptically and sometimes with glaring contradictions. What it has stated is that it is (or possibly was, at any rate) a traveler who has been to many countries, a father of one to seven children, husband to a wife who has been described both as shrewish and angelic, and a hobbyist philosopher. It has not been determined whether RPC-007 is truly unaware of its state or simply refuses to acknowledge it. Its preferred subjects of conversation are philosophy and politics. Characteristically, there is absolutely no consistency to the beliefs and ideals of RPC-007, as it can proclaim the superiority of Communism at one moment and sing the praises of free market Capitalism a mere hour later. Dr. Zimmer: Hello Joe. It’s nice to meet you. RPC-007: Now how is it that you know my name, friend? I don’t quite recognize you. Dr. Zimmer: Oh… Well uh… My friend, Dr. ██████, told me about you. RPC-007: Oh goodness. I sure hope he didn’t exaggerate my good qualities. I got along so well with that man. Good man, him. What’s he doing nowadays? Dr. Zimmer: He had to be reassigned. I can’t say where. So I’m the new researcher posted here. Dr. Zimmer: So you’re an explorer then? Where have you been to? RPC-007: Oh, all over, friend, all over. I’ve been doing this so long, I don’t think there’s a square foot on Earth I haven’t tread upon. Dr. Zimmer: So what are you doing right now? RPC-007: Well I ain’t treading anywhere right now. No, sir. Right now I’m just taking it easy. A man my age needs his rest. Dr. Zimmer: A man your age? How old are you, then? Dr. Zimmer: I’m afraid I don’t. RPC-007: Ah well, one day you’ll be old enough to know. Yes sir, some day everyone’ll end up like old Joe. Dr. Zimmer: What do you mean by that? RPC-007: Anyway, you ever hear about that fellow, Cortez? Closing Statement: The conversation carried on for several more minutes on the subject of Spanish Conquistador Hernando Cortez. No more information of value was extracted by Dr. Zimmer. Requests for permission to investigate the internal processes of RPC-007 and other forms of invasive study will not be considered until it can be reasonably determined whether it is truly alive or not. There is a big difference between dismantling an anomalous object and vivisecting a living thing and that difference is the amount of paperwork and committees your damned requests have to go through.